Crisp, characteristic and full of sheer comfort is the Linear Bar Stool in White. 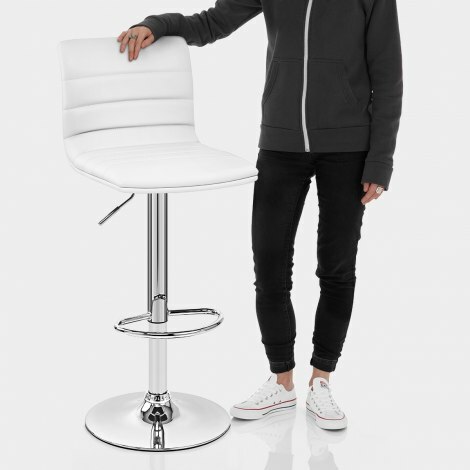 Minimalist style is showcased in the fantastic Linear Bar Stool with its sleek framework and clean-lined seat, giving it the potential to be the finishing touch to your home. Lushly padded throughout the seat and high backrest you will be supported and sitting in pleasure. Wrapped around the seat is soft white faux leather that is durable and easily cleaned by a damp cloth. The stitched lining of the seat adds style to the Linear, adding to its appeal. Finished with a chrome frame there is the gas lift mechanism, 360 degree swivel, semi-circular footrest and round domed base, giving added dynamics and functionality to the Linear. Completing the package is a protective rubber ring around the edge of the base for the practicality of keeping your floor in pristine condition. "Very comfortable and look great in our new kitchen"
Fab stools, very comfy and look great. Was a little confused with 2 boxes on delivery when I ordered 3 stools - however two stools where in one box. Excellent service, packaged well, stools look fantastic in my new kitchen, would recommend to friends. Very well priced and good looking kitchen stool. Comfortable and wipe able. Very good buy. 3rd or 4th time have ordered from Atlantic. As usual great service prompt delivery and well made products . Cannot recommend them more highly.